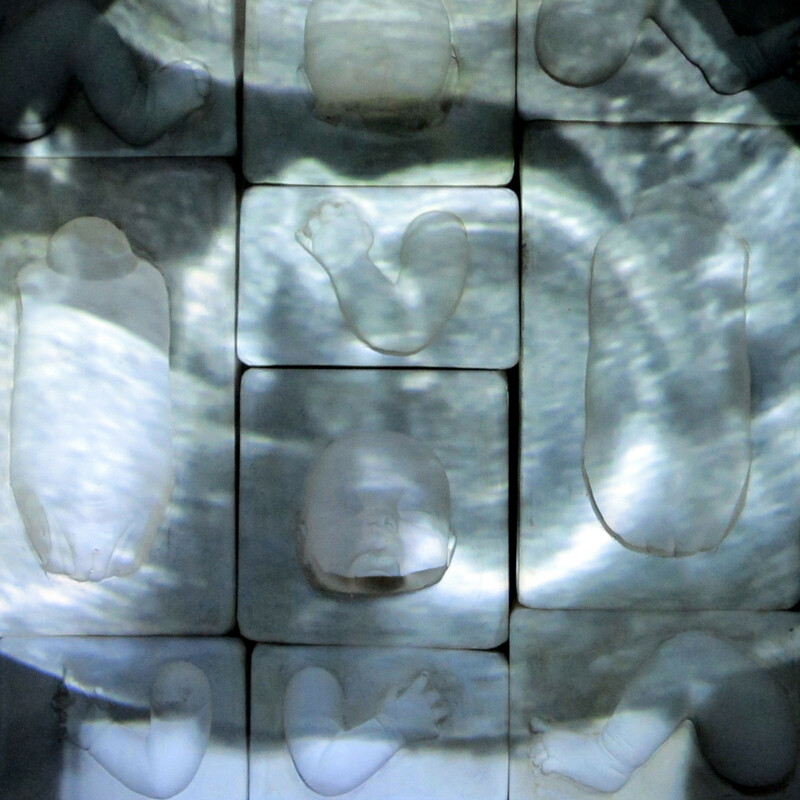 Womb looks at the relationship that making/ representing figurative sculpture has with the biological body’s ability to reproduce by visually projecting a sonogram video of an infant in the womb onto a number of moulds that together comprise parts of an infant’s body. Sonograms have become the standard method of monitoring the development of a baby in the womb. These instantly recognizable (iconic) images give us a glimpse into an otherwise mysterious process. This biological “making of a person” has a direct relationship with the making of a figurative sculpture, which can also be a mysterious process to the audience. This is true especially in ceramics, because of how ceramic material changes in look and feel through the alchemic process of kiln firing. The plaster moulds become a kind of visible womb that could potentially give birth to an infant sculpture and this mirrors the non-visible womb that the infant in the sonogram is understood to be in. There is also the psychological relationship that making a baby has with the making of figurative sculpture. People tend to want to have children to carry on their name and lineage. Making a sculpture (or artwork in general) also carries this notion of wanting to leave a part of one-self behind.